As I have mentioned on J.Crew Afficionada, today my (concept) store received their first shipment of Fall 2012 collection. Of course I rushed there like a madwoman. Well, I wasn't disappointed. I think there is a lot to love for everyone. It is a beautiful collection with many interesting items. I grabbed about 20 things to try on, including pencil skirts, dresses, pants, cashmere sweater, various tops and a tweed blazer. I will be posting reviews for a few days. Today I only have time and energy for a store display pictures. The chicken sweater was not in the store, but I tried the capris. The first pencil skirt and gold bow capris not in store, I tried the first cashmere sweater, black and camel cami and the dress on the last mannequin. I did not see the top in store but I tried something slightly similar that I think many of you may like. This dress was also not in store, but they have other version of Jules, in black and white print, that I tried on and also in black white striped (with some thin red edges) and solid green one, I think in wool. The blouse was in store but I didn't try it. Also showing navy version of Downtown field jacket, very pretty. Now, the accessories section was also interesting. Love those blue and green envelope clutches! 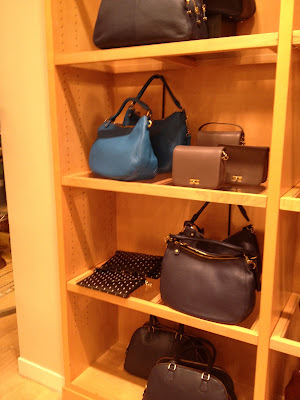 Blue Brompton and cute polka dot clutches. Another view of blue Brompton. Yellow Edie collection and more colorblocking, this time in pink and orange and black and tan. 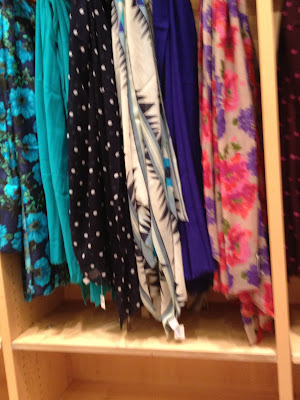 There was also plenty of new scarves. 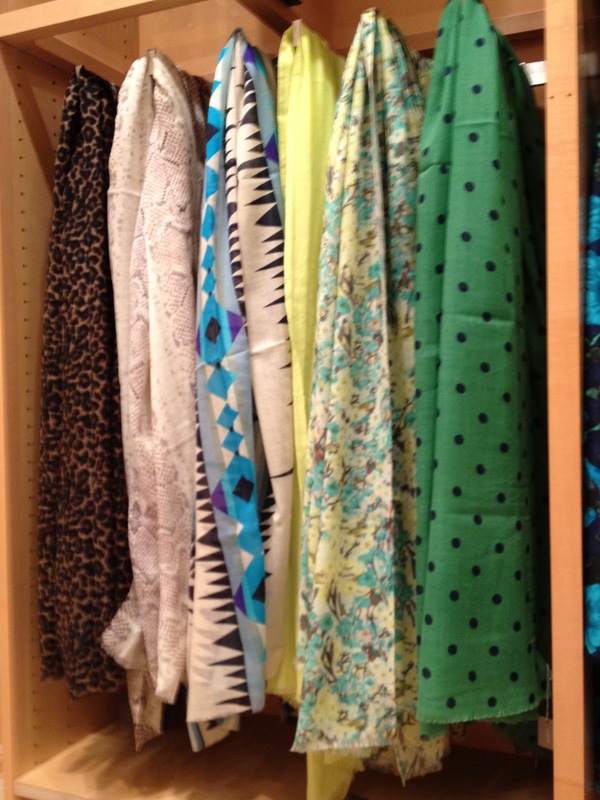 It is nice to look because they are often indicative of colors and prints to come. 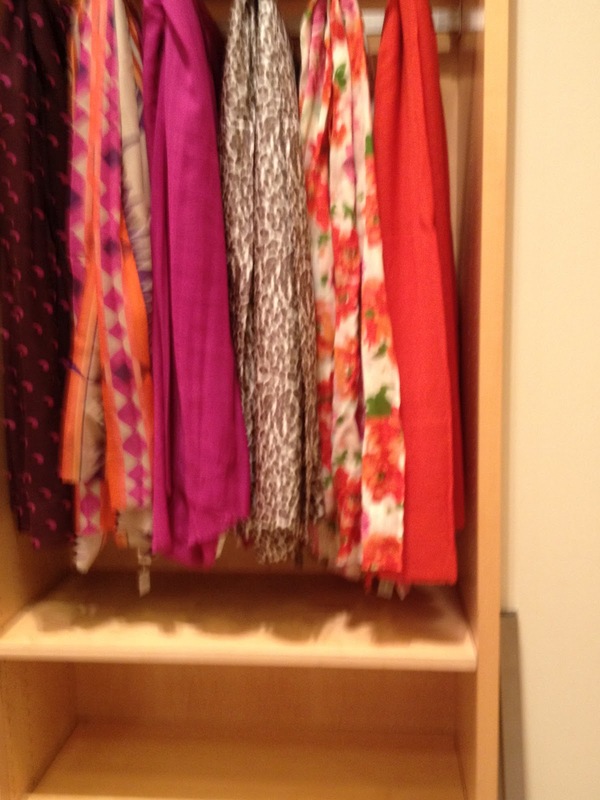 Here is about half of the stuff I took to the fitting room. I forgot to take a photo of the other batch. I liked quite a lot of it. I think I am in trouble. Why oh why did I spent so much on the summer stuff??? Please share, it would be no fun without you!!! OOOOOOO, thanks SO much for these pictures!! You're the best!!! Thank you so much. Everything looks so pretty. I love the bib collar sweater. Was the bib collar an accessory or part of the sweater? 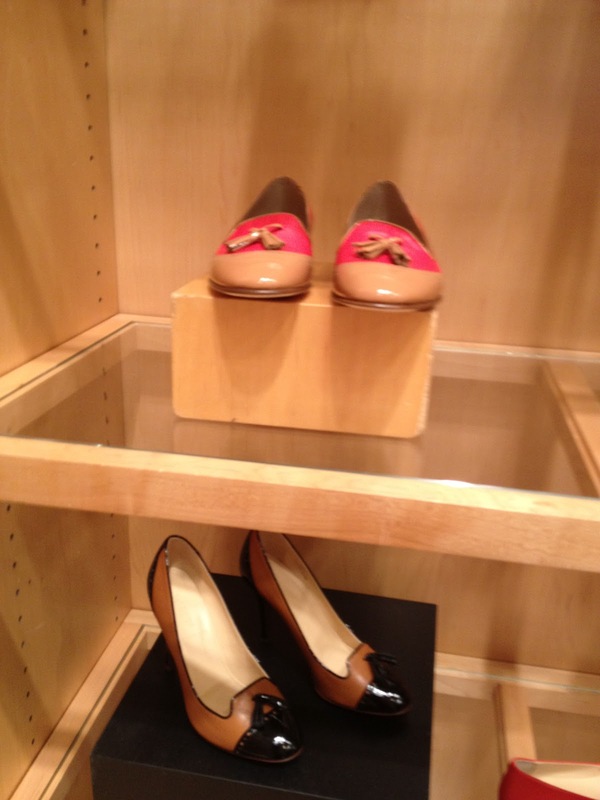 And I love the black and camel combinations. I can't wait to see your review. Not sure about this sweater but looking at the catalog I think it is detachable and very pricey. Yes, thank you! I can't wait to see some reviews. I see a lot of intriguing stuff here. Love it thanks! 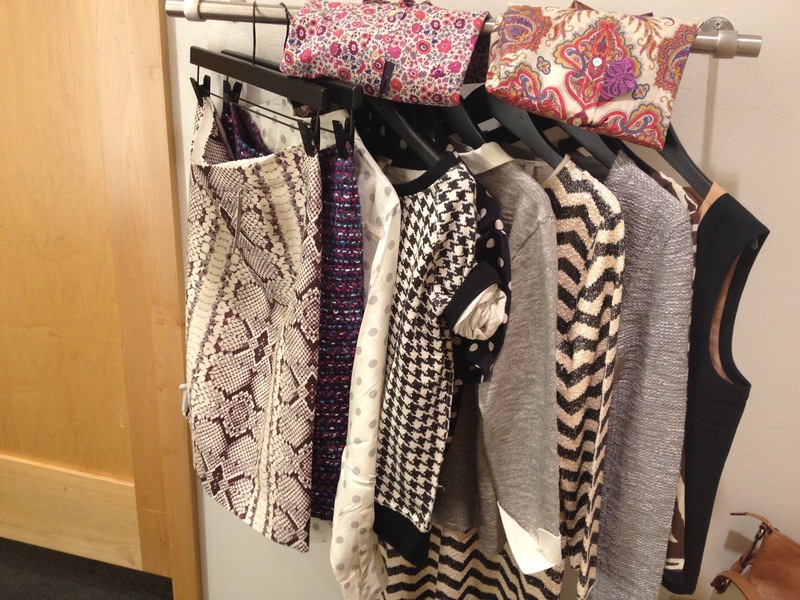 Am very intrigued by the geometric print scarf, the liberty-like print sweater and the chicken sweater. Can't wait for your reviews! Ooooh! So exciting!!! I love the blue color of the brompton. Might have to have that! Love these photos - thank you so much for taking the time to post them. I spotted quite a few things that are going into my fall wish list. It looks like they have come out with a really good collection this year. Can't wait to see your reviews!! I love the colours but that chain has ruined them, it's like a biker chain! Ooh, looks like lots to love. Thanks for sharing! Looking forward to more pics! Can't wait to see more pics! 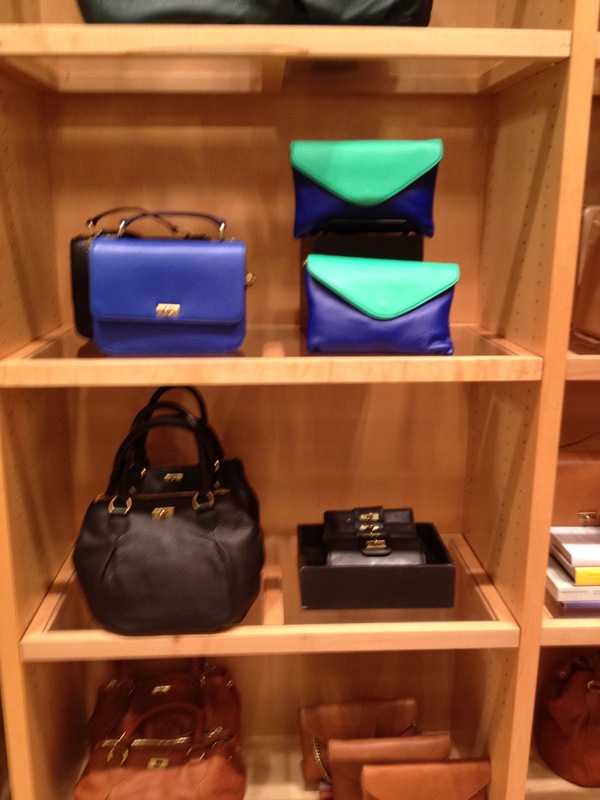 Love those color blocking clutches. A lot of very cute stuff, so excited! I am still loving the color blocking trend! A SA in my local store showed me those envelope bags that she had in the back -- they're clutch shaped but have a chain strap with a leather pad (how do you describe that?) at the shoulder. Both of the color combinations are gorgeous! She asked me "the problem is, which to get?" and of course my answer was "I know, so you have to get them both." She said, "yeah, you are the WRONG person to ask." Scary that I buy more JC than a lot of the JC employees do...! Thank you for sharing! 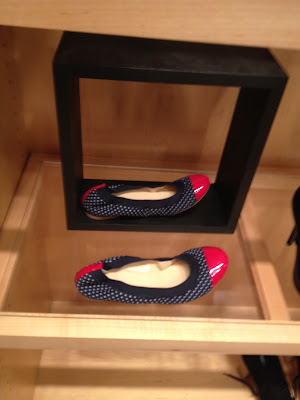 AJC, what exactly is a concept store, and is it different from a collection store? concept store gets inventory ahead of other stores so they can test the customer response and decide on inventory levels for other stores. 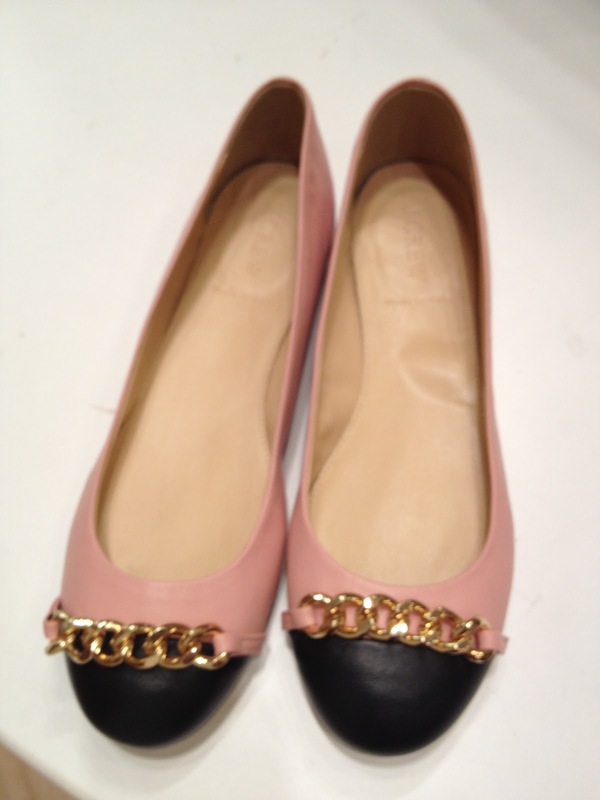 Those pink and black shoes were top on my list too, although they are tied with the saddle brown /cream combination! I knew you would come through with great pictures. Our paths probably did cross today- we might need to combine our efforts next time! Oh my, complete drool- and I thought I am not ready for the Fall, he he. I absolutely love the blue shade of the bag and the Chanel-like looking flats- gorgeous! love the browns and subtle prints...and the chicken! THANK YOU for posting these pictures!! As if I wasn't excited enough for new arrivals already. I love the jeweled peter pan collar top on the manni and the pencil skirt (kind of looks like snakeskin?) on the rack. 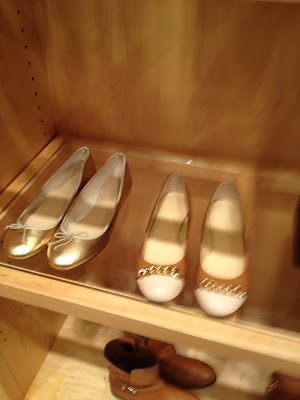 Also the shoes are gorgeous...they are evoking a little Chanel to me. Can't wait to see the reviews! Thanks! I love that top with the jeweled collar on the reclining mannequin! Added it to my Polyvore as a reminder for fall. WOW! From the Look Book preview I didn't quite like anything. Now I can't wait to see the whole collection. Thanks! Can't wait to see your reviews. 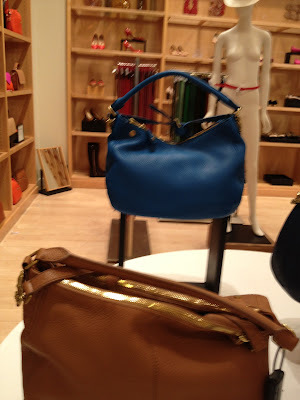 I emailed them abut two items I loved both turned out to be around$900! Ack, Tabitha, that is appalling! Thank you so much, AJC, these photos are great - lots of wonderful colors and styles. I don't know how you do it. I'm always afraid to take pics in the store! I can't wait to visit our store when the roll out arrives. Looking forward to your reviews! Thank you, ajc. Now i can sleep in tomorrow morning, no more early rising for sale! Must second WFF - no longer interested in sale items and will be saving the $$ for the new Fall things. Thank you so much for the photos, looking forward to your always excellent reviews! Thank you so much for all the great pictures. If all those shoes have leather linings I'm going to have some explaining to do! 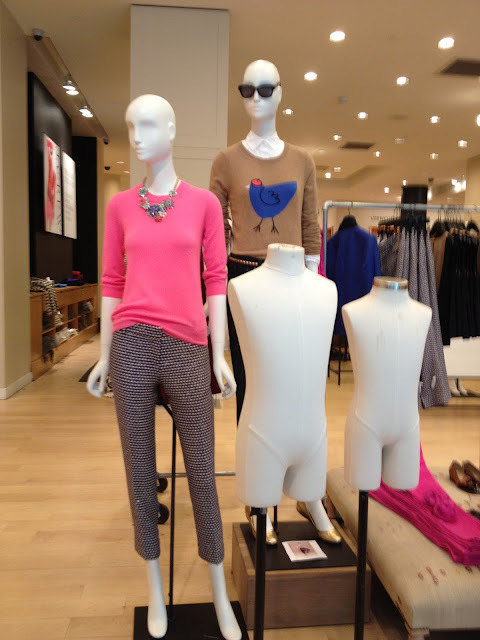 The chicken sweater is hilarious and reminds me of the Madewell sheep sweaters - they must be coordinating on this trend. I like the glittery zigzag sweaterdress, but I imagine it'll probably be a Collection piece. Overall, much better than I was expecting! Most of 2012 has felt extremely basic and staid, and I'm glad they're returning to more interesting territory. Thank you!! I'm so glad you included a photo of the blue Brompton! Excellent. I be been keeping my powder dry for this! It made me come to my senses,no more summer stuff for me! Thank you so much AJC - I sort of feel like you have been our scout, heading out into the wilds on the part of the community! Please-o-please - i need to see that snakeskin skirt on you!! You are so awesome AJC! Can't wait to see your review of the snakeskin skirt. I'm really eyeing that for Fall! Wow, that's a lot of stuff!!! :))) thank you for sharing! I must have the jeweled peter pan collar sweater and the coloblock pumps. Tgank you so much for sharing but you are not allowed to go to work today, you have to post the fitting room pics first! I also like the peter pan collar sweater. It sounds like they are sticking with the shape of the Jules dress which is not flattering on me, that will save me at least. Lots of leopard still which is interesting! I was tempted Dani (and Ema) but I actually had to wake up early for some conferences with people in Euro time zones. Seriously, sometimes I want another job. There are so many cute things! Thank you very much for posting these. I agree w Ema, the peter pan collared sweater is very cute. 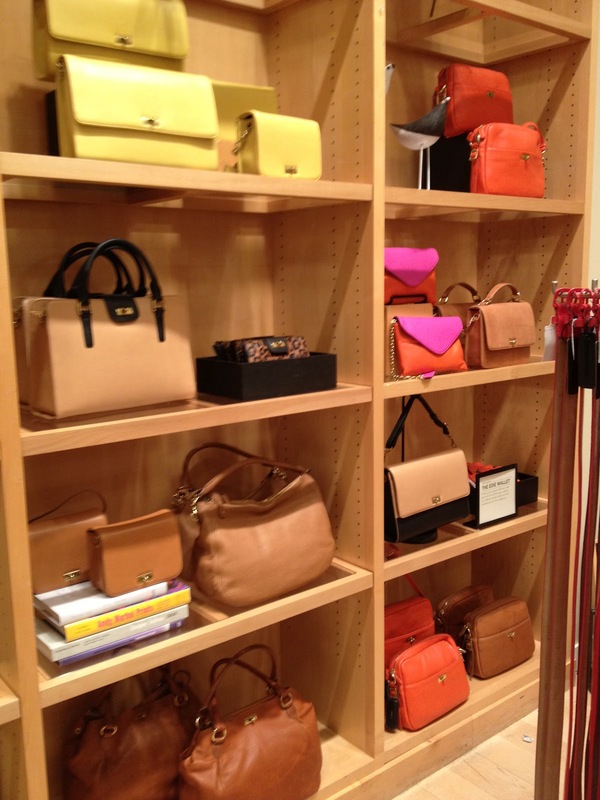 I also need to get my hands on some yellow bags. Thanks so much for the pics...LOVE that sweater in the third pic with the sequin peter pan collar. The peter pan collar sweater is a must for me! Thanks for the pics. 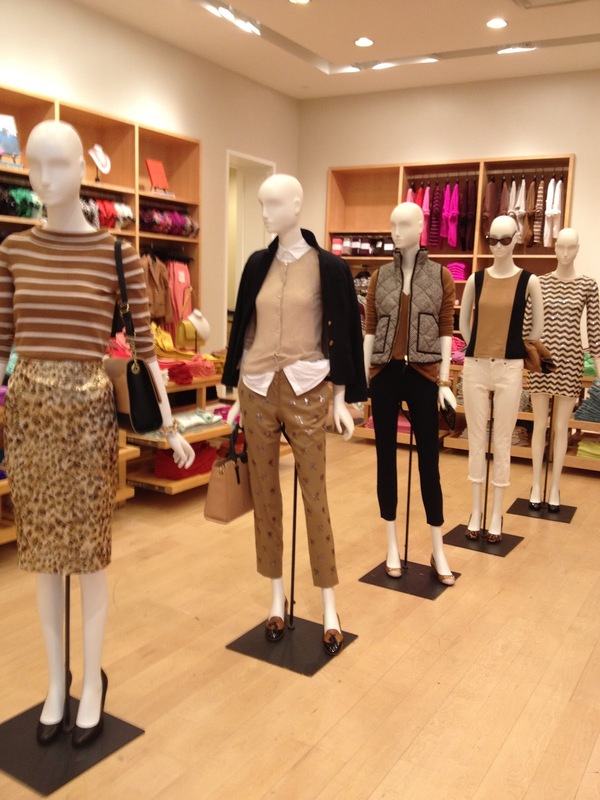 I am liking what I see so far for 2012 Fall JCREW (finally!). This is making it easy for me to put away the walled on JCREW sale/Summer items because I'm done. Pocket book is getting fatter for FALL purchases!!!! Looking forward to many pics myself. Thank you so much - everything looks wonderful. Please tell me the chicken sweater is merino (more affordable) not cashmere!! It is adorable. Also must have the peter pan collared sweater as it looks gorgeous. Can't wait to see your upcoming fitting room posts. I'm kind of sorry I placed an order this morning but most of the items were NOT final sale. The two items marked FS are less than 15 dollars, so I suppose I can deal with that! I did not touch the chicken sweater and it was only on display but it look like merino. I feel safe from the shoes, these aren't calling to me, although I will admire them on others, they are very pretty. Did you happen to take pictures of the jewelry on this trip? Thanks so much for sleuthing out and reviewing the new things! well, some chicken grow up to be roosters, right? I don't even know lol! I was just in the store yesterday (while waiting two and a half hours to get my i-phone fixed next door....) and they did not have any of this new stuff in. I love those patterned trou with the pink sweater! I tried those pants and they are very nice, I should have review on Friday. Other stores should get their Fall items next week and probably not everything included here, because this is a concept store and they get some stuff a month ahead. Thanks for the update, I missed the sweater, I was probably just too frantic with my husband calling me asking when I am coming for dinner, lol. Or maybe the sweater sold out before I got there? We should have a GSP JCAs group! 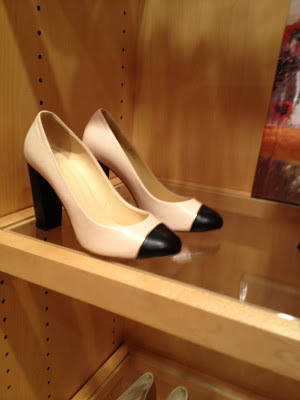 jcrewfanatic, is the collar detachable? ajc--thank you so much for posting!! You're an amazing help to those of us without a B&M close to us:) I can't wait for your fitting room pictures--several of those tops look beautiful as well. 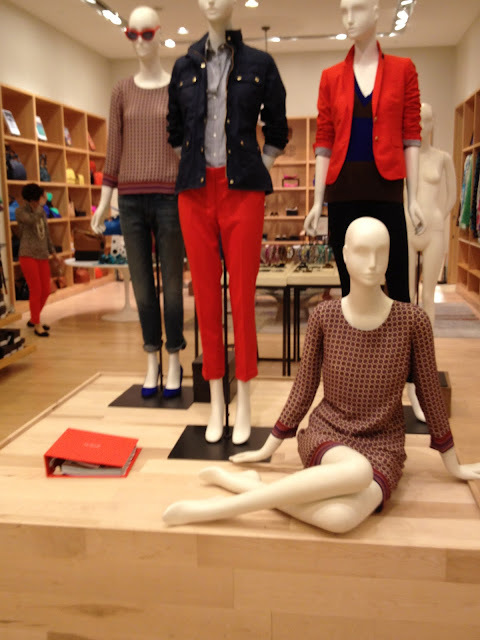 jcrewfanatic--Do you remember what the sweater is made out of? Does it feel like it might pill at all? I feel like I have to have it, even for $198...pill-prone material might be the only thing that stops me! Hello everyone! I stand corrected...the jeweled peter pan collar sweater is $178 not $198. It is 50% alpaca and 50% wool. It is a collection sweater and the quality seems a little better than the typical tippi sweater, for example. The collar is not removable (I was told in the store that it was, but upon further inspection, it is not). AJC, I went back to the store today and they had more of these sweaters out on the table. They seemed to have replenished and put some new items out that were not there when I went on Tuesday. BTW, the snakeskin pencil skirt flew out of the store! There was only 1 left in a size 2...that seemed to be one of the more popular items in the store. I went back to get it today and no luck, so I'll have to order it online. It's definitely worth another trip back to the store as everything is organized nicely now. jcrewfanatic, I have worked with Tatyana before, she is great! My stylist is Nancy. Please email me (my email is linked to my blog) and maybe we can set it up. Definitely! Maybe we can try to set something up in August...hopefully reward cards will be out around that time and they should have another roll-out! Fun, fun, fun!!!! Thanks so much for all the pics! I am eagerly awaiting your reviews. I love the peter pan collar sweater, but that's way too much for my wallet. :) I'm hoping you also took the asian inspired pencil skirt to try on - I'm dying to see more than the sliver from the catalog pic! What's up with the white shirts? How bold can you go?